Israel and Hamas Warily Agree to a Three Day Ceasefire!! “Israel has accepted the U.S. / U.N. proposal for a 72-hour humanitarian ceasefire beginning 8 a.m. ( 0500 GMT ) Friday,” said the official, who made the statement on condition of anonymity. Five IDF Soldiers Killed by Mortar Fire; 72-Hour Truce to Start Friday Morning!! 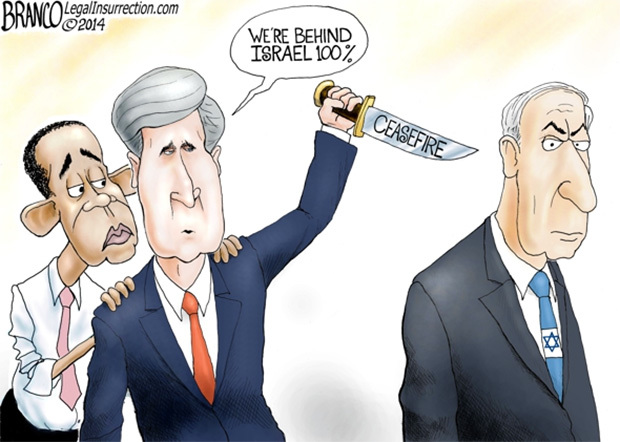 Israel and Hamas have agreed to a 72-hour humanitarian ceasefire, the U.S. State Department announced early on Friday. The statement said the truce will begin at 8 A.M. Hamas subsequently said that the Palestinian factions with abide by the agreement. Prime Minister Benjamin Netanyahu on Thursday said that Israel will continue to destroy infiltration tunnels from Gaza regardless of ceasefire efforts. “I won’t agree to any proposal that will not enable the Israeli military to complete this important task for the sake of Israel’s security,” he said. On Thursday, five Israeli soldiers were killed by mortar fire near the border with the Gaza Strip. Earlier that day, two people were wounded by rocket fire in the southern city of Kiryat Gat. Meanwhile in Gaza, 84 Palestinians were killed over the last 24 hours in the Gaza Strip, and 258 were wounded. According to the Gaza Health Ministry, the Palestinian death toll since fighting began is now 1,442, and the number of wounded has risen to 8,295. Source: Now The End Begins!! All Palestinians need Jesus Christ as their Personal LORD / KING / MESSIAH / SAVIOR so they know the Truth!! « Benjamin Netanyahu Says Regardless of Ceasefire All Gaza Terror Tunnels will be Destroyed! !